I spent 3 weeks in Portugal in November. I’ve trained with Portuguese horsemen for a number of years now, own and love a Lusitano horse, and have always dreamed of exploring Portugal. The opportunity arose, and I took it! The trip was all about horses, really, Lusitanos specifically, and a strong need to have an adventure and a vacation. While there I spent time at the Valença Equestrian school (Centro Equestre Da Lezíria Grande). Sofia Valença has been coming to Washington and helping me with my horse, Exodus, in clinics for a few years. The Valença school is a dressage training facility that has about 60 Lusitano stallions trained to the highest levels of dressage. They use their stallions in a touring show that travels around Europe called Apassionata. Apassionata is much like Cavalia. Master Luis Valença, Sofia’s father, has been vital in the production of the show. 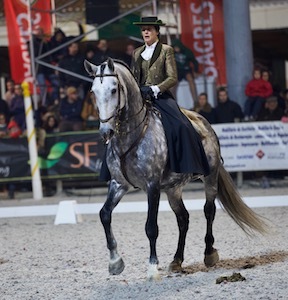 The Valença family provides the riders and stallions who do the dressage work including the “airs” like capriole, levade, and courbette, and create the choreography. When the horses aren’t touring and doing shows, they use them in the school near Lisbon. At Valença’s I had lessons on the stallions and worked on my dressage skills. Nothing improves one’s riding more dramatically than riding numerous horses that are confirmed in the upper level movements. The horses teach you, and it helps to give the feel of “correct” riding. I knew before I went that it would be a great experience, but the surprise and most joyous part of the trip was meeting other horsewomen from around the world. While I was at the school I met and became friends with students who came from Australia, England, France, Holland, South Africa, and of course Portugal. We instantly bonded! We had lunches and dinners together, packed ourselves into a silly little car and drove around seeing the sights; we talked about horses, shared stories, and laughed until our sides hurt. What is the equestrian lifestyle? This is it. That wherever we go in the world there are horses; they are all the same regardless of their breed and resident country. They speak horse, same as ours do. And horse people receive us like family. We have a bond that runs deep. Shared interests and passions create instant friendship. Throughout my life, horses and their people have enriched me and led to extraordinary adventures. May it be true for you too. Kim Roe was raised on a horse ranch in California. Before deciding to pursue dressage seriously, she trained and competed working cow horses, hunters/jumpers, trail and event horses. Kim trains both horses and riders for USDF dressage shows at her Blue Gate Farm in Acme, Washington and serves as the coach for the Skagit Valley Pony Club. Contact her at bluegatefarm@yahoo.com or through Facebook.